Movable Type supports “cloning,” or making a duplicate version of a blog. You may want to clone a blog in order to reuse a blog’s design, it’s settings and its content when creating a new blog. The blog’s Site URL. You will need to specify this URL in the new blog’s settings. The blog’s Site Root. You will need to specify this filepath in the new blog’s settings. Navigate to the System Overview blog listing by clicking on the System Overview link in the upper-right hand corner of Movable Type and choosing “Blogs” from the drop down menu. Select the blog that you wish to clone. 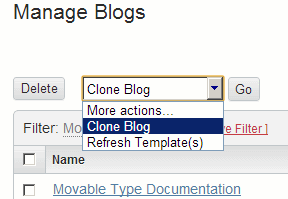 Select “Clone Weblog” from the items actions menu (More actions…) and click the Go button. A dialog will pop up showing the status of the cloning activity. When the system has completed cloning the blog, it will prompt you to either return to the blog listing screen, or continue on to configure more settings for the new blog. Note: Only one blog can be cloned at a time. If multiple blogs are selected, a popup message states that you can only clone one blog at a time. Note: only users with blog creation permission (as defined by their system permissions) are allowed to clone blogs. If a user does not have blog creation permissions, Clone Blog will not appear in the list of items actions.